Learn how to get involved in food systems work, get access to healthy food, and get involved in the campus farm and gardens. The 13th edition of the free Campus Food & Garden Guide is available online and at sites throughout campus. Members of the Food Systems Working Group and CASFS facilitate student opportunities to engage in food systems work. From creating organic gardens to meeting students’ basic food needs, UC Santa Cruz has pioneered the campus sustainable food movement. The 2018-2019 Campus Food & Garden Guide reflects the campus’s many options for students to engage in food systems work, get access to healthy food, and get involved in the campus farm and gardens. 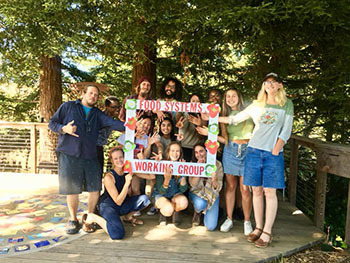 Produced annually by the UCSC Food Systems Working Group and the Center for Agroecology & Sustainable Food Systems (CASFS), the 48-page guide brings together information on the campus organizations involved in food systems work at UCSC. The thirteenth edition of the free guide describes internships, classes, grants, workshops, and volunteer options for students who want to get involved in sustainable food systems, from learning how to grow their own food to shaping policies for sourcing food served in the dining halls. This year’s publication features a new section on the CalFresh program and how qualified students can access this statewide resource to support their food budget. There is also information on other food access resources for students who may be facing short- or longer-term food security challenges, including expanded campus food pantries, the “Swipe for Slugs” program for dining halls, “Double Bucks” program at the weekly organic Produce Pop-Up market. Readers can also learn about the history of farm-to-college and basic needs work at UCSC, Global Food Initiative Fellowships, Measure 43 funding for student projects, cooking and nutrition workshops offered throughout the year, and the campus’s “Real Food” goals. 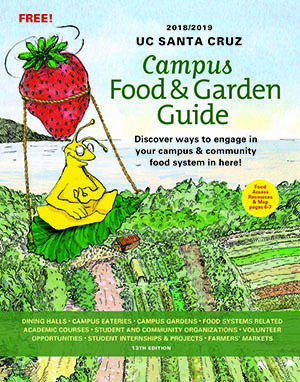 Pick up a free copy of the Campus Food & Garden Guide at campus libraries, the Bay Tree bookstore, the Cowell Health Center, the Student Union, OPERS facilities, campus dining halls, and other sites throughout campus. A pdf of the printed guide is also available online. Contact Tim Galarneau or call 459-3248 for more information or if you would like copies delivered to your office.